Yes, you read that right. It took me 3 years to truly declutter my stuff. IT WAS THAT BAD. The good news is that I ACTUALLY DID IT! 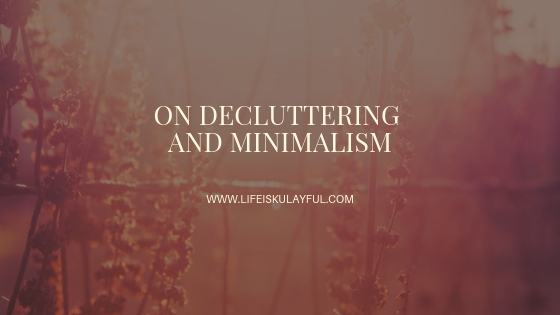 Now it's time for me to talk about what I let go in the last 3 years that I slowly but surely decluttered my life. I had over 1000+ happy meal toys. I've been collecting since I started making money and I had a few from my childhood. I let go of some initially but then I kept an entire megabox to myself. However, seeing that it was still untouched for the next 3 years finally pushed me to give it away. Besides, I didn't see myself buying a house big enough to fully showcase it. Imagining the cleaning it would require also scared me so that had to go. I have accumulated clothes because I kept getting bigger and bigger then I was in denial and thought that I'd trim down again. So for years, the pile of clothes that were still great but did not fit continued to grow. Eventually, I had 5 megaboxes of clothes. I finally gave 4 megaboxes away and kept only one. These are the clothes that I really wanted to keep but I am also setting a year end deadline. If I still don't wear any of these clothes, they will have to go by end of the year. I gave away to the helpers, to the construction workers near our home, the women's shelter, the church, and the baranggay center. I figured they needed it more than I ever did. I tossed over 30 pairs of shoes in a span of 3 years. I finally learned not to buy those that look cute but would kill my feet or those that are simply in fashion but would leave me feeling like a cuckoo months later and asking myself why did I buy that? Now I go for the classics and the comfort. I started collecting when I was a teenager. 20 years later, I had two megaboxes of notebooks. I finally gave away most of it to a public school and kept less than 20pcs. I've also made it a point to actually use the notebooks that I have. I had 600 + books. I gave away over 500 to different people and different schools. I kept less than 100 and those are the ones that I plan on displaying in a mini library when I finally get one. I had 2 megaboxes of scrapbooking materials. Yesterday, I finally let go of 90% of it and just kept the ones that I will be able to use for my daily journals. These went to public schools and a baranggay center. These were given away as gifts to friends, family, relatives, and even random strangers. Now, I feel lighter, better, and simply ready for what 2019 has to offer. I don't need those things anymore and it makes me happy that I was able to make so many others happy simply because I chose to let go of my excess stuff and give it to those who actually want it and need it. PS. I also gave away some of my bags but mostly to the help and to relatives.